Acrok Video Converter Ultimate is top H.265 Video Converter which can convert H.265 to H.264, convert H.264 to H.265, etc. Video to H.265 Converter– Convert almost all popular video to H.265 formats, such as MPEG, MP4, MKV, H.264/MPEG-4, H.265, MOV, H.264 etc. H.265 to Video Converter– Convert H.265 to other videos, e.g. MPEG, MP4, H.264/MPEG-4 AVC, H.265, MPEG-4, MKV, TS etc. Acrok H.265 Video Converter, a best convertion tool for H.265 movie, can convert almost all popular video e.g. MPEG, MP4, MKV, H.264/MPEG-4, H.265, MOV, H.264 etc. to H.265, also can convert H.265 to other video formats. With this H.265 Converter, you can also extract audio from videos, such as MP3, WMA, AAC, WAV, CDA, OGG, FLAC, APE, CUE, M4A, RA, RAM, AC3, MP2, AIFF, AU, MPA, SUN AU Format. Just free download H.265 Video Converter, and enjoy your favorite movie on your iOS device (iPhone, iPad and iPod), Android device or many others. Convert video/audio files and play them on devices such as iPod, iPad, iPhone, Android phones etc. Introduce NVIDIA CUDA & AMD APP technology to gain the best performance in H.265 video conversion. Converting H.265 video with multi-core CPU will get the highest speed. To save CPU resource, you can customize the core number to process the conversion. Support all popular MP4 players like iPod, iPhone, iPad, Android device etc. The H.265 video conversion can be finished in the background for less CPU occupation. 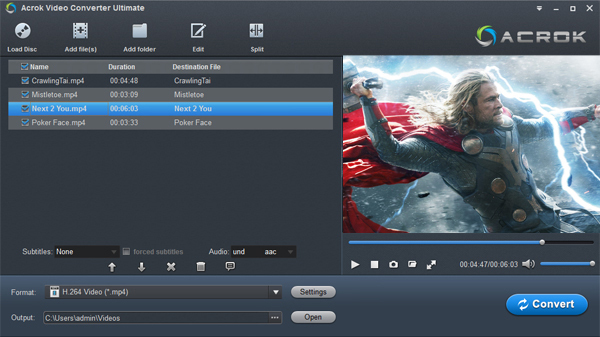 H.265 Video Converter provides English, German, Japanese and Chinese language for different mother-tongue users, and several skins for meeting different tastes.